hobovogue . 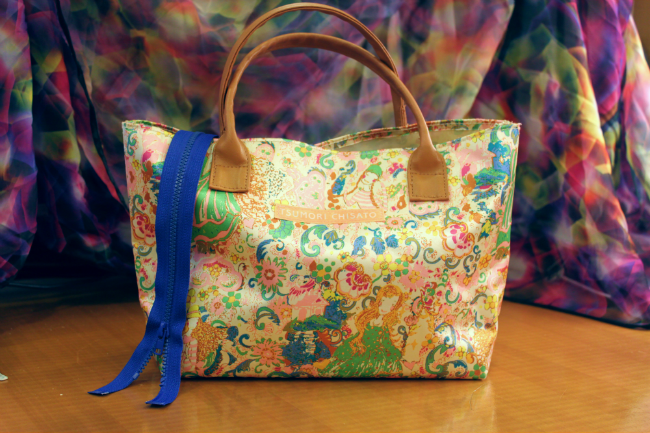 : DIY tote with zipper - Tsumori Chisato! 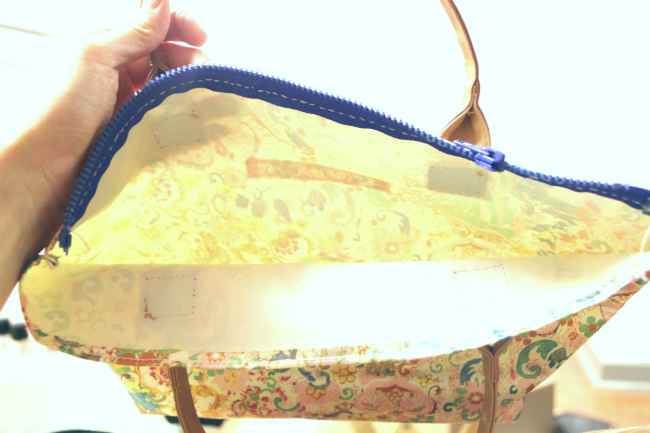 DIY tote with zipper - Tsumori Chisato! Do any of you have random totes lying around that you love but don't use that often because you're scared things will fall out of it? Here's my hobo solution - just add a zipper! How do you sew a zipper onto a tote? Simple :) Just need a needle, a zipper long enough to line the top of the top, some sewing thread and a lot of patience. I got my supplies from (where else) the dollar store around the corner, ($1 for a sewing kit) and my 12" zipper came from the crafts store a few blocks away for $2. 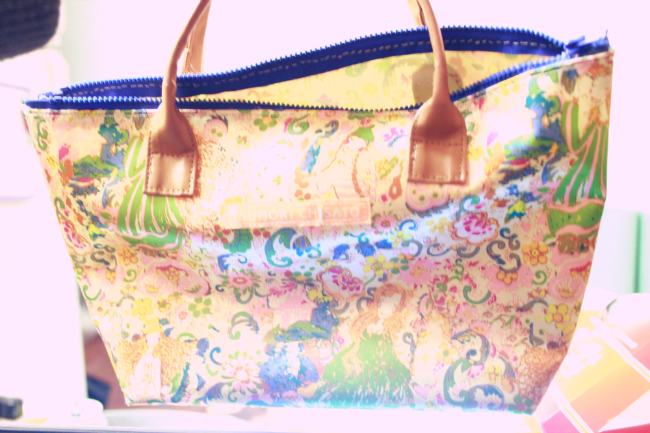 The featured tote is an Ebay find - a colorful, perfectly "hobovogue" Tsumori Chisato tote. I fell in love with it the second I saw it - it has a beautifully complex print of florals, fauna and random figures scattered throughout the tote in an irreplicable design. I'm guessing that the tote was originally some sort of makeup bag - who knows? I feel like I've given it a new identity by sewing a zipper on it - so much handier now that I don't need to worry about little items falling out of it! Done! I love the bright blue pop of color the zipper adds too - how do you all like the transformation? You can see my hand-sewn stitches - they aren't perfect, but they do the job okay. 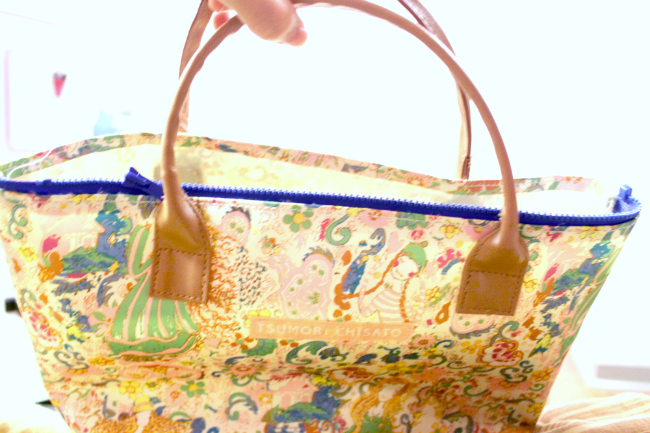 Not to mention, I absolutely adore Tsumori Chisato designs and can't wait to get some use out of this magically colorful bag! hello.just came across to ur blog.its nice.im following u at gfc.